It’s gone a bit quiet here as I’ve been preoccupied with all sorts of things – our new flat is taking shape, so I’ve been spending time choosing paint colours, painting, filling, putting putty into windows and all kinds of decorating jobs. There are tons of boxes all over the place, and the thing you want is always in the bottom of the bottom box. I’ve finally moved my desk, filing cabinet and everything out of the office space I’ve rented the last three years, and into a corner of the bedroom. It probably doesn’t sound ideal but the room is big, I get a lovely quiet workspace and a view out the window and it’s a joy to have everything in one place. 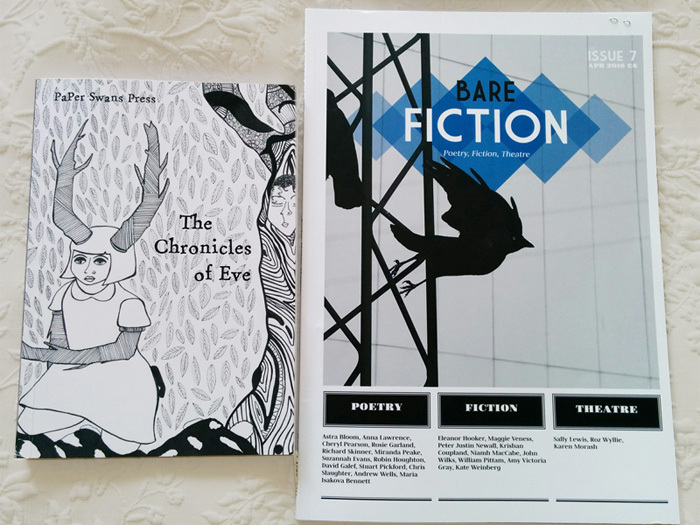 On the poetry front I was very pleased to receive my contributor copies of The Chronicles of Eve, an anthology from Paper Swans Press, and Bare Fiction Issue 7. The Chronicles of Eve is a kind of testament to womanhood, its joys and (mostly) tribulations. Eighty or so poems from a wide range of poets, many of whom were unknown to me. It’s hard to pick out my favourites but I really enjoyed Marcia J Pradzinski’s ‘When I Ask My Father To Sign College Prep Forms’, Victoria Gatehouse’s ‘Burning Mouth Syndrome’ and Claire Walker’s ‘Pisces’. A great job done was done by Sarah Miles in putting the book together, and the cover design is stunning. Bare Fiction is still a relatively new magazine but it ‘punches above its weight’ (sorry, that’s just too much of a cliche not to need quote marks) thanks in great part to its editor Robert Harper. Robert puts a huge amount of time and dedication into producing and promoting the magazine, with its unique mix of poetry, prose and plays. Not only that but he really supports and gets behind those he publishes, whether in the magazine or in book form. In my experience it’s very rare for a magazine editor to ask questions about the poems s/he has already accepted, or suggest light edits. The selection process for Bare Fiction is anonymous and there’s a willingness to take a risk with slightly unusual material. And the format of the magazine is equally unusual with its big, easy to read typeface and poets’ names almost embarrassingly large on the page. I’ve tried to get in here a couple of times with no success but I’m glad I persevered. 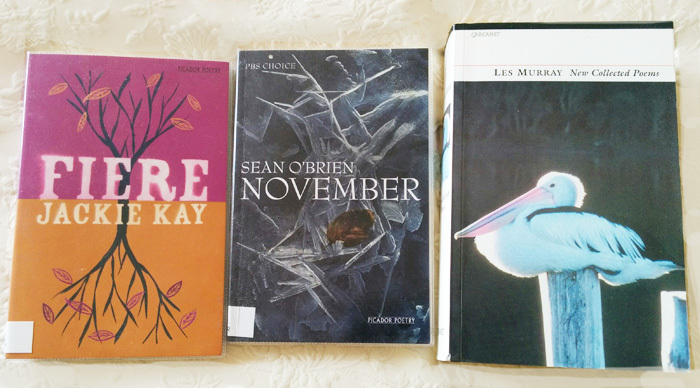 On my bedside table at the moment I have two books borrowed from Eastbourne Library (which appears to have a small but not too disgraceful poetry section) – Jackie Kay’s Fiere (Picador 2011) which I’ve read right through and loved, and Sean O’Brien’s November (also Picador 2011) which I’ve been dipping into. Awaiting my perusal is Les Murray’s New Collected Poems (Carcanet 2003) which is an absolute tome. I plan to read it in chronological order, as advised by John McCullough (whose New Writing South course I’ve been attending this year, and who has introduced me to all sorts of interesting poets). 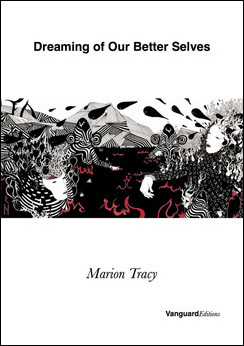 I want to also give a shout out to Marion Tracy‘s first full collection, Dreaming of Our Better Selves (Vanguard Editions) which is hot off the press. Marion is a friend and we’ve participated in many workshops together, and I also enjoyed her excellent Happenstance pamphlet Giant in the Doorway (2012). On the jacket blurb Neil Rollinson speaks of ‘a vibrant imagination… slightly bonkers, off kilter but always fascinating’ and I’d agree – a rich read. Congratulations to Marion and to Richard Skinner at Vanguard for snapping Marion up. Well done on your publications. I have read a copy of Bare Fiction in the past and like Paper Swans Press. I’ve also read the Jackie Kay book of poems. One of her poems was one of the first I had to analyse when I took an OU course and she’s been a favourite even since. My current favourite magazine right now is Popshot. The stories and poems are unusual and the artwork is stunning. Thanks Heather – yes I’ve seen a copy of Popshot, some similarities to Bare Fiction I think. It’s always interesting to read work by new names too.